Beer … Had a few bottle of Ninkasi Brewing Company Tricerahops Double IPA…if you have had this I must make the clarification that I did not have these "few bottles" in one sitting. There was a few 24 hour cycles between them. I have had this stuff before, first trying it up in WA about 3 years ago…Very good and very under appreciated new brewery, though they are part of Sierra Nevada's Beer Camp Across America 12 pack…they did a nice light Double Latte: Coffee Milk Stout. If you have not heard about Beer Camp Across America and the upcoming 12 pack release check it out http://beercamp.sierranevada.com. Music…So I am late to this band I know, but so others are not here we go. Blitzen Trapper … GREAT Rock, Alt Country, Indie Band. I bought American Goldwing and Fur but I am going to get the newest Album VII this week as well. I think American Goldwing is my favorite of the two albums I have so far…Also just bought the new Front Bottoms EP and am listening to it as I type this out…So far so good. These guys are hard to classify… kind of indie folk I guess…Great lyrics and melodies. It is summer folks…fish, drink, listen to music. Life is short. Enjoy. 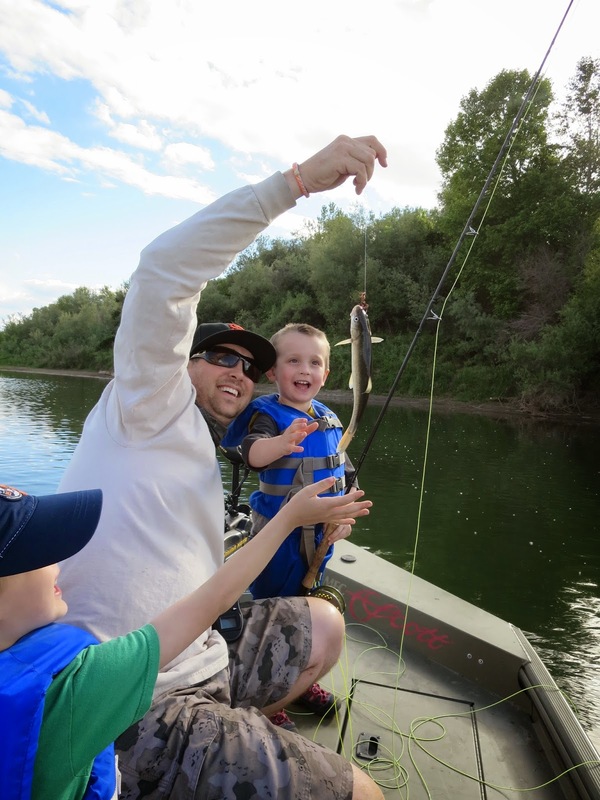 Summer: Fishing Reports, Drinking, Sports, Sons/Daughters…Things to celebrate on Fathers Day. So, First of all Happy Fathers Day to every father out there. Enjoy the day and revile in the experience of being a father. I can personally say there is nothing that has changed my life more or made me happier then being a father. I could give everything in my life up before I would give being a father up. Public service announcement to all fathers, get your off spring out doors! if you are reading this blog you have some affinity for the outdoors, someone created that and nurtured that in you, Share it and pass that same affinity down to your kids. This is tough, it takes stepping away from what you want to do, or your time on the water. A fishing trip becomes something different when you have young kids…believe me I know with a 3 and 6 year old. My free fishing days become swimming, rock throwing, mixed with some bluegill, shad, or pike minnow fishing (the most overlooked fish for kids). Many times I have guided Fathers and their teenage or pre teenage children on their first "fishing trip" together and some times it takes and sometimes it doesn't…a kid that has never been outdoors until they are 13-17 years old is hard to all of a sudden "get into" fishing or being outdoors. I am a strong believer in that it must be nurtured and shared early in life. There is no better fishing partner then a son or daughter, but like most relationships it takes investment. Invest when their young, share your passion, and pass on your love of the outdoors. Shad: Fishing is slowing down and fish are moving up river. 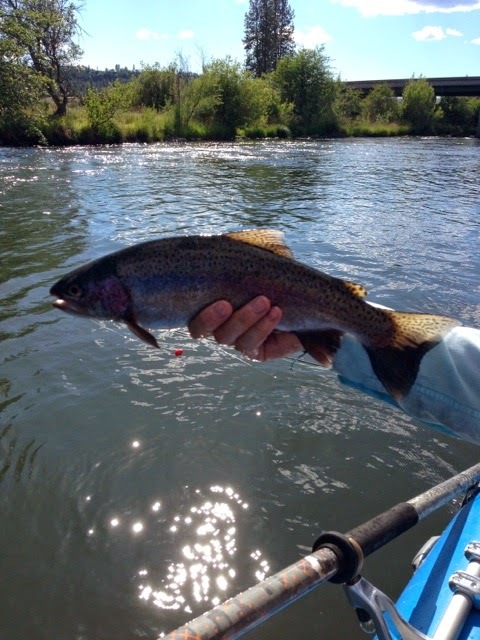 There are still fish around throughout the Chico area but the bite has been late and the schools seem to be shrinking in size. Striper: Fishing is starting to pick up for stripers. Some shakers and smaller keeper size fish are starting to be caught on a fairly regular basis and reports of some 8-10lb fish are floating around. July-early september is prime time but like most things this year fishing may get started early. Bass: Topwater fishing during the evening has been good in the backwaters for Largemouth bass. Frog fishing over and around the weeds has been pretty fun…good 3-4lb fish caught in the last few weeks. 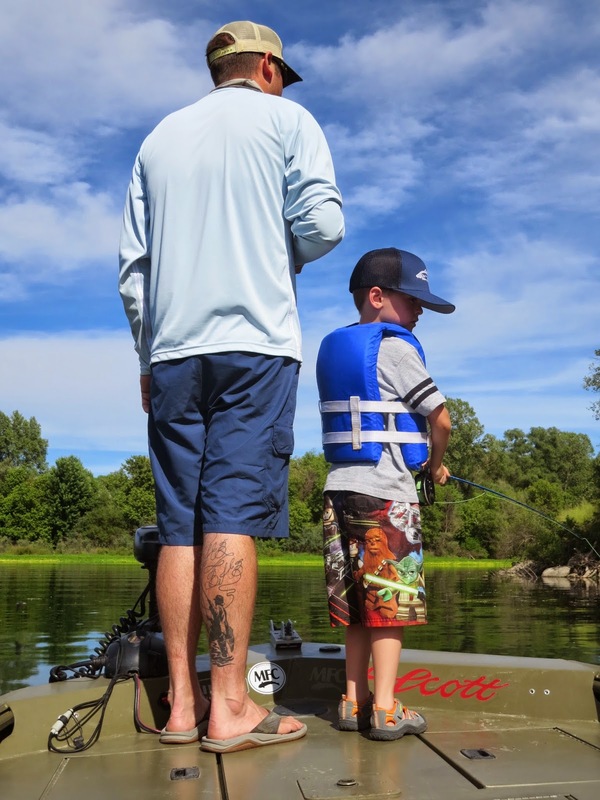 Trout: Trout fishing on the Sac has been pretty consistent and summer is one of the best times to float down through the lower river from Balls Ferry down to Red Bluff. Beautiful canyon and lots of wild rainbows if you can take the heat at times. Pit River: Spent 4 days on Pit #3 and Pit #1 the last week in floating and wade fishing. Both fished incredible, great numbers of fat and wild Pit river rainbows with plenty of 14-15" trout and even some in the 18-20" bracket which are real beasts in the tight fast pocket water of the Pit. 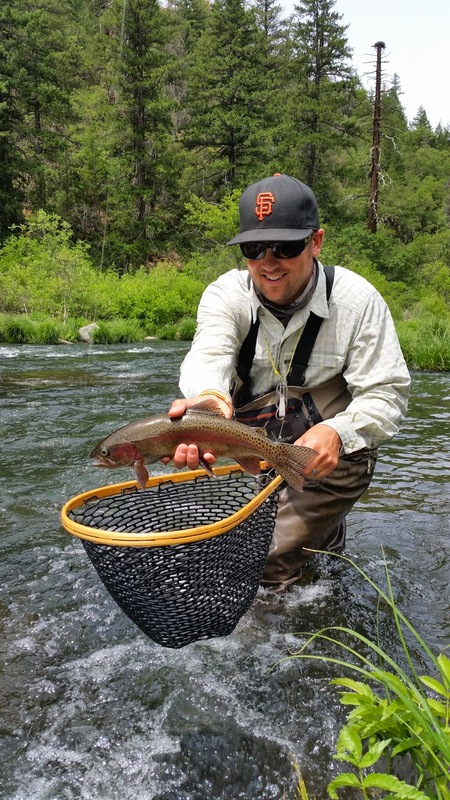 Lower Yuba River: With the cooler weather this week fishing has been good throughout the day. The golden stones are starting to appear and caddis, PMD's, Little Yellow Sallies, and PED's are around. 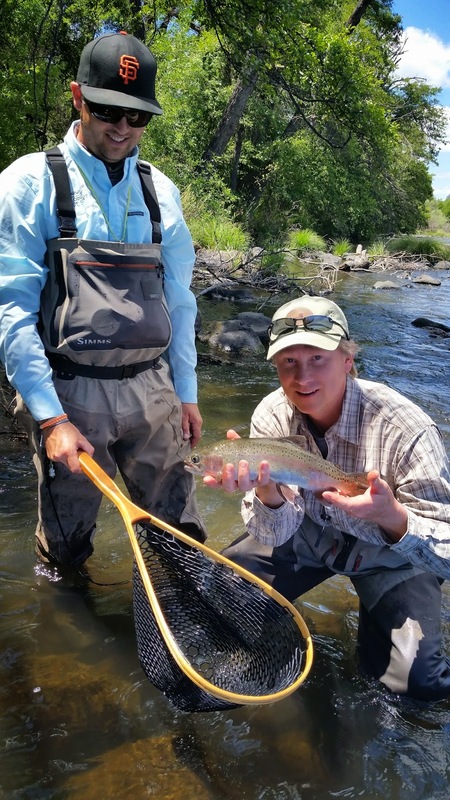 Best dry fly fishing is during the evening hatch but fish are opportunistically looking up throughout the day. My new favorite river beer…Hams. Don't knock it if you haven't tried it. 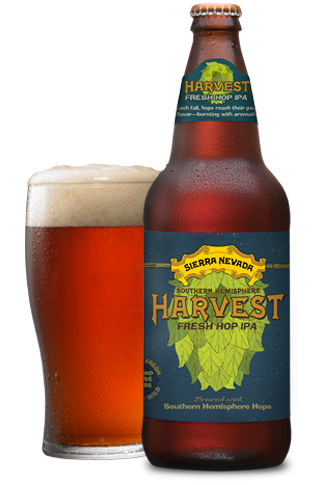 I also had a few bottles of the new Southern Hemisphere Harvest Beer from Sierra Nevada. Fresh Hope IPA…good stuff. I like the first Harvest beer this year best so far. Word on the street is there is some new small batch Sierra coming out this week as well…stay tuned. I was hoping the Giants would avoid the "June swoon" but after watching them give up the last two games in the 9th inning blowing a 5 run lead and a one run lead on crappy pitching and defensive errors to the Rockies…. all after loosing 3 of 4 to the Nationals…both sub .500 teams, I think we are swooning fast. Largemouth – Top water fishing has been good during the evening in the back waters and sloughs. Weeds are coming up, frogs are active, and bass are focused on the surface. On most evenings fish are cruising the and we have been able to sight fish to some nice fish in the 3-5lb range with frog patterns. I have also been seeing some fish chase the smaller bluegill so I am sure a bluegill pattern would be a good idea as well. Not sure how long this fishing will last as the weeds are coming up pretty good in the back waters with the lower flows and lower water. Smallmouth – Fishing has been hit or miss…Find them one day not the next. Fishing sinking lines and weighted flies is the ticket for these guys. A buddy of mine did pull a nice fish off a weed bed this weekend and I had clients drop a few fish crawling flies in a few runs. Carp – Some nice carp are getting up on the few flats that have water up on them. I have had clients hook about a fish or two on each flat before they are toasted and the fish bail out for deeper water. Not sure how long this is going to last with the weeds coming up and fish getting a little spooky with the lack of water. Shad – Shad fishing has been fair to good just depends on the night. The river has been crowded with shad fishermen most nights but there is plenty of fish and room for everyone. Stripers – are fat and happy on the bottom of the river digesting shad. 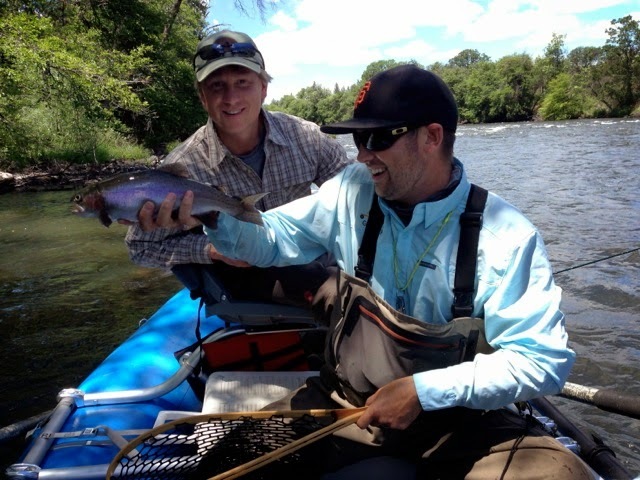 Lower Yuba River – I have not been on the river for a while but flows are good around 1140cfs. 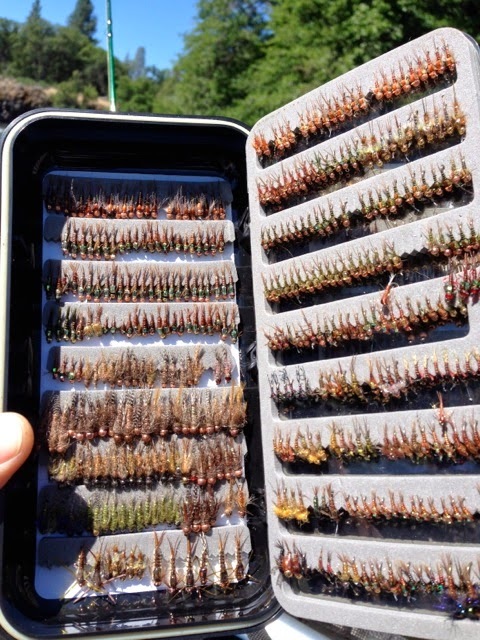 I have heard the caddis, PMD, and PED hatches have been decent some afternoons and evenings depending on day time temperatures. Usually at this time of year the cooler the day the earlier that hatch.